For a thousand years, the Dragon-Blooded have ruled Creation from thrones of jade, secure in their power and authority as Princes of the Earth. Through command of the elements and mastery of every martial discipline, their ruling bloodlines exercise dominion over the wealth and armies of the world. Now, in this time of tumult, their hegemony is challenged by breakaway states, monsters from world’s edge, and the dreadful power of the Solar and Lunar Anathema. This Exalted 3rd Edition sourcebook provides everything that players and Storytellers need to introduce the Dragon-Blooded into their story. In addition to details of life in the Scarlet Realm, Lookshy, and among a variety of outcaste groups, it covers character creation and Dragon-Blooded Charms, along with new Merits, spells, martial arts styles, and heirloom artifacts that can be included in any game. Sadly, Onyx Path freelancer Alejandro Melchor recently suffered a stroke and is currently comatose. Steve Kenson put together a #RollForAlex bundle with over $350 of material for only $25, with proceeds going to Alex’s family to help pay for treatment. 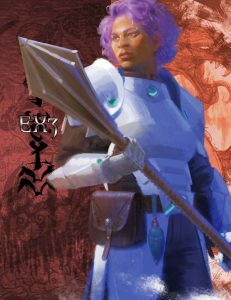 Onyx Path has contributed the Trinity 1e rulebook. Our Kickstarter for a prestige version of the upcoming Contagion Chronicle crossover chronicle for the Chronicles of Darkness started last week! We currently have $54,366 of our $50,000 goal, or 109%, with 1076 backers. We’re doing well so far, and are looking forward to the month ahead!